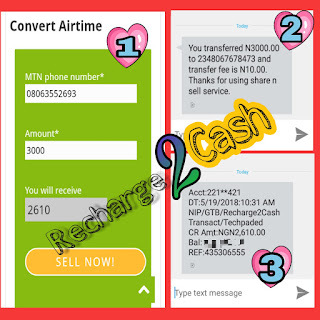 Recharge2Cash makes it possible for you to convert airtime to money deposited into your bank account. It boasts as one of the fastest airtime converter in Nigeria with 99% automated transaction. What airtime can be used? Recharge2Csash now accepts accepts all networks, which includes MTN, Airtel, Glo, and 9Mobile. How do I convert airtime to cash? Using our online converter, it is as easy as the image below. What is the minimum and maximum airtime amount accepted? This varies for all four networks. The lowest airtime amount you can sell to us here is ₦750 for MTN, and ₦1000 for Airtel, 9Mobile and Glo. The money will be sent into your bank account once we receive your airtime. We charge only 18% fee on each MTN airtime transaction. So we will send N800 into your bank account if you convert N1000 airtime (20%), and so on. This is the cheapest offer available in Nigeria at the moment. Check our Charges and Fees page to see others. Do I get referral commission? Coming soon. We plan 2% referral commission on all airtime transaction. The service is developed by Techpaded, a well-known IT organization and technology website in Nigeria. The app is organized by vibrant and dynamic young entrepreneurs.